Here in my garden with Patty's Plum, one of the most dramatic of big Oriental poppies..... and with Allium Christophii (below, right). This sort of planting makes me realise I can be something of a drama queen in the privacy of my own garden, but Christophii has decided to spread itself around the place, as have the equally big Alliums, Purple Sensation. So has this bright red honeysuckle, rescued as a dry twig many years ago and now weaving itself all through the frame of the big swing, so that visiting sons can barely manage their chin-ups. Many plants do their own thing in my garden. I put them in the ground and stand back. Things that are difficult to grow sometimes escape from where they have been carefully planted and appear somewhere else, somewhere that is meant to be inappropriate, but they have decided otherwise. Some things just appear all by themselves, like the great big pineapple lily eucomis that came to live under the kitchen window. I have no idea how it got there, but it's very happy by the drain and puts up more flowers every year. When the going gets tough the garden is a huge consolation. There is always something to do, and I mostly manage to do it, one way or another. There is always something interesting happening, and there are visitors who come and share it with me. 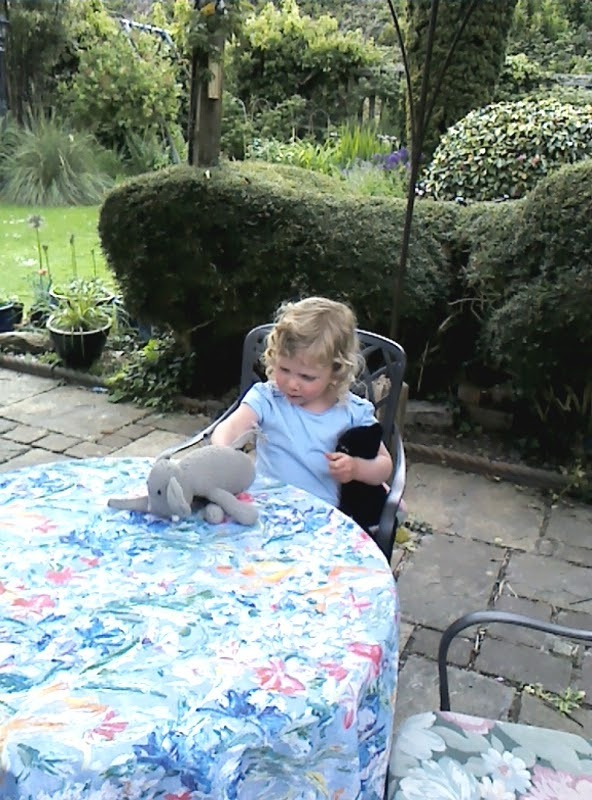 Granddaughter waits for afternoon tea, and she had (mostly) made the shortbread. I am grateful to the kind people who expressed concern over my lack of blog postings. I hit a bad patch, as we all do, and so went to ground for a while. I am very appreciative of the concern. A very accepting and welcoming garden. A place where flora and fauna (including a granddaughter) can find a place to be themselves. Indeed, the garden that inspires. I'd wondered where you were although I am not about Blogland much these days either. Love your garden - just what a garden should belike. Zhoen: Granddaughter probably has more places than most. She has her own house (Walnut Cottage), the large summerhouse as a supermarket where she shops for her family of dolls and animals, and the small summerhouse as the 'sea-side' where she has a sand and water tray. She is kept very busy, but there is still room for families of birds, a few badgers and foxes and quite a few cats with muderous intent. Marigold: I hope all is well with you and yours. Have you mislaid the bus pass? Not lost the bus pass - in fact I had 4 nights away recently - more my muse! I haven't had anything to tell for such a long time but I might get round to telling you all about my trip to Totnes in due course! Gardens are indeed healing magic. And solace. And worth the blood, sweat and tears that they demand. I hope your bad patch has been invaded by volunteer plants of the emotional kind. Marigold: I'm glad about the bus pass and look forward to seeing your latest trip. E.C; blood, sweat and tears are very appropriate. I'm still recovering from a rather dramatic fall on to stone paving! Gz: thank you. Pete has drunk a fair amount of tea in this garden.